Having A Blast On The Net: Who's happy? THIS GUY. I am so glad this has worked out well for you. You deserve it. Now, when is your next furlough? Someone said you broke bread with Chizik. I really hope you ordered a diet coke. Glad it's been a good transiation for you. I have enjoyed all the SUBSTANCE over at the new site!! Jay Giddy Tate is as happy as a clam. I know why you are happy, but I'm not sure I understand the basis of the clam's jolly emotional state. Just messin' around. What should I write about here? I can't talk about Auburn or football or my current employer. So, this will be the Jay G restaurant, hotel, and spirits guide. Either that, or talk about Norm. Either will work for me. Cannot talk Auburn, football or employers? that pretty much kills most conversation. How about a Jenna Fischer blog? Or there's Steve's Norm discussion. Well, clamming up means you stop talking. Maybe we should say - make like a clam. Shut up and be happy. Really? You really can't talk about that here? Well, ok. I guess we have other avenues for that. I have some trees that could stand pruning. I'm thinking I'll wait til the leaves are gone. I feel subliminally advertised to. An inspirational person continuing to inspire. That's Jay G Tate. He's having a blast! BOOM ______________. Do you arrange, design and sell shrubberies? Yes, shrubberies are my trade. I am a shrubber. My name is Roger the Shrubber. Is that a Crape Myrtle pruned in that picture? I have a new favorite Class of 2013 prospect. QB Max Browne from Sammamish, WA. Surely he's voting for HAM SAMMICH this November. Ham Sammiches and Brownies ... what a pair. Are those Spice Brownies. If so, AU is a lock! THT I think it's understood and accepted as a given. On this blog or any other, on news sites, catching up on politics, or sitting on the can...whatever I'm doing, I'm also hating uat. And if hatin' uat is wrong, I don't wanna be right. Help Gilligan get off the island. I am fine with your hatred. Doesn't affect me. Thanks, JGT. I'll throw in a bit of disdain for Duke just for good measure. Is it too late in the season to prune hydrangeas? Or is this just the crape murder blog? depends on the type hydreangea. Are you a mophead? Most common varieties bloom off of "old wood," so the buds need to set in the stems that are left prior to going dormant. I have a 1989 Olds Ninety-Eight for sale. First $2,000 gets it. Do you take Eurasian currency? I honestly can't recall ever having done any Hydrangea pruning and they've always seemed to do fine with year after year blooms. I suppose it's possible that GMB may have done some of their pruning but I rather doubt it. Crepe Myrtles... I just take off a few inches each season in the dormant period. Eurasian currency? No, I don't need more members of my harem. This new format is not unlike a bush/tree. There's one big main thread and you can create a little thread/branch that forks off of it. You crawled out on the wrong limb, Norm. This is the limb where you talk about selling cars and acquiring harems. We got more cars than people, JGT, so I think I'll pass. I drove a similar Dodge Dynasty for a couple of months after I wrecked my first truck. you could fit like 100 people in there. Bench seats! Well, I'm not trying to sell a vehicle. And I'm not interested in a harem, I don't think I could handle one. So, other than that...GET SOME! Or whatever you kids say. No doubt. One wife (hot as she is) is plenty. I need some motivation to write my "Theology & Doctrine" papers (and others) for my Provisional Membership application. they're not due until Nov. 15, but there is a ton of stuff to write. I'm not good with long deadlines. Who has some good anti-procrastination tricks up their sleeve? I've never procrastinated on Theology & Doctrine papers. I expected some sort of ghoulish picture along with a sudden scream. Especially after the countdown. Just skimming through the comments. Are you guys talking about how my Aunt Myrtle was cooked and wrapped in a thin French pancake? You've got ants on your crape myrtle? Sounds bad. You should probably burn it. No you bunch of idiots, get with it! 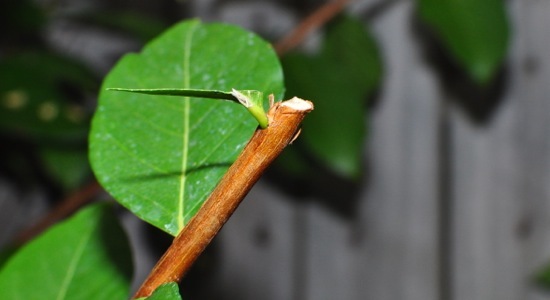 We are all talking about the Crepe Myrtle Killer. He or she is still out there, somewhere. My guess is it's Art Vandelay. He's creepy AND loves crepes. How bad is this. Is this Crepe Myrtle Killer, like, cereal? Is this guy after the whole breakfast buffet? So this thing is on pacific time. I guess that means HABOTN is running, in it's various forms, in three different time zones. That's pretty big time, JayG. We'll need at least one more iteration of HABOTN then to cover the Lower 48 timezones. Those Rivals guys seem pretty savvy. I bet if JayG asked they'd put GTR on Mountain time. I got a strange feeling this will become the puppets blog. having to retrace one's way up the trunk and go back out every branch just to keep up is confusing for a dolt like me. It's hilarious that if you click the HABOTN banner in the Auburn Tiger Sports section of the Advertiser it directs you here. Dang if they ain't got a bunch of nincompoops runnin' the show over there. Substance aplenty available from JGT and others at auburnsports.com, I'm still getting the hang of the GTR forum. Who is Robert? What alias do we know you by? I have a Uncle Robert but I don't think that's him. Things have not been pretty at AuburnAuthority lately. Broken links seem to be the new standard in reporting and yesterday they lost everyone's avatars. It's pandemonium. I think this Robert guy is my friend from high school, Frank Clay. Well, there was this Robert my nutty sister was married to for 6 weeks. (That was about 3 years after she left husband #1 after 20 years.) I doubt it's him. Pretty sure its Bobby Knight. It's just Bob Sacamano. No biggie. Could it be Robert Klein? The new MA Auburn beat writer is James Crepea. Sounds a bit too French for my taste. You can call him Jim Pancake, if it makes you feel better. Pancake it is. The guy hasn't make it to the AA forum yet, but he now has a nickname. THE NEW GUY IS THE CREPE MYRTLE KILLER!!!!!! My name on 1.0 and 2.0 was just Rob. Real name is Robert. IS it a REAL name, Robert? Why do you saw it as if you fake name? Since there IS a fake name, we can only assume that they are all fake. So let me get this straight, we now have a pancake and a faker robert? I said real because of michael's frank clay comment. Oh Frank, you are too much! Anyone have any scoop on our starting center getting arrested last night? not here. that can be found elsewhere. this is football free. no free football scoops anymore. That would never happen. You type treason. Burn him. He's a witch. Inside scoop? Nope, not here. scoop of what? Ice cream? You know how bands or comedy acts have an opening band/comic to get the audience warmed up prior to the main act? Whatever the opposite of that is, that's what the MA has done in the time in between beat writers. Complete clean slate. New competitor to the market. They're gonna come back all grassroots and take people by surprise....or go out of business. Which is also fine. I think they are adopting a Prince Hal strategy. You guys aren't seeing this right. What MA has done is pure genius. JayG set the bar pretty stinkin' high. What MA did is reset the bar. That thing is set like a championship match of limbo. Buckeye James would really have to be a complete schmuck to not make that place better right now. Kinda hard to fall off the floor huh? He'll need permits and heavy equipment to get that that thing any lower. He can only aspire to one day have a blast on the net. I woke up to some crazy thoughts to process. Lots of stuff going on in my dreams. DO NOT DREAM ABOUT LOVE. Or guns. or cliff diving. or coleslaw. Last night I dreamed I was tasked with an eating challenge. One of those where you have to eat the whole meal in a certain amount of time. There was a spicy drink, seafood sampler type fair, some kind of dish with lucky charm type marsh mellows, and two cheese cakes at 8oz each. I totally hammered the whole thing. Finished with time to spare. True story. I mean that really is a dream I had last night. A hallmark of my dreams is a constantly, randomly changing setting, like I'm in one of those Wes Anderson American Express commercials from a few years back and find myself in a new, completely different locale every other minute. There's no common link or theme either. It's like a dream I have over the course of one night's sleep is a collection of short stories that have nothing to do with each other. I'll be interacting with somebody inside some building somewhere and then I find myself alone walking amongst the high grass of the Serengeti Plains.